Copyright Notice: All photos in this blog post are copyrighted by Jo Ann Creore. All rights reserved. 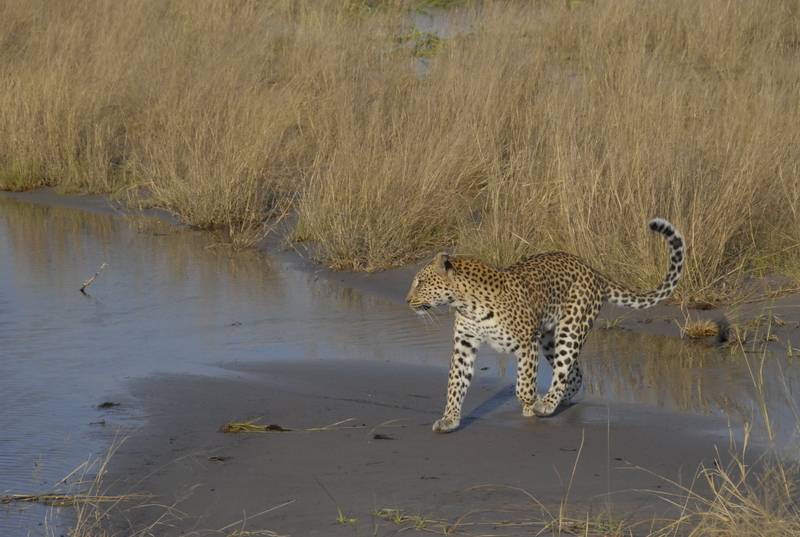 On a previous safari in Tanzania, I was fortunate to see a few leopards, but we never lingered long in one place, and our sightings were accidental. 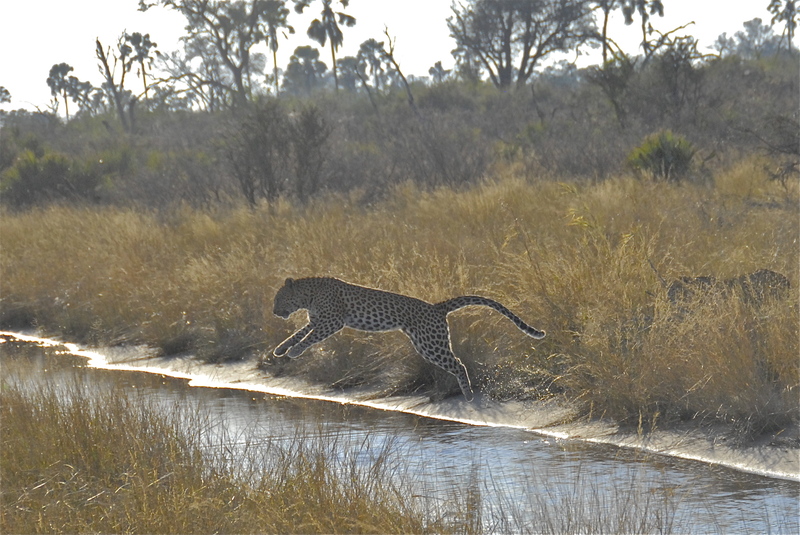 In Botswana, however,we actively tracked predators, and once we found them we stayed with them, sometimes for hours. 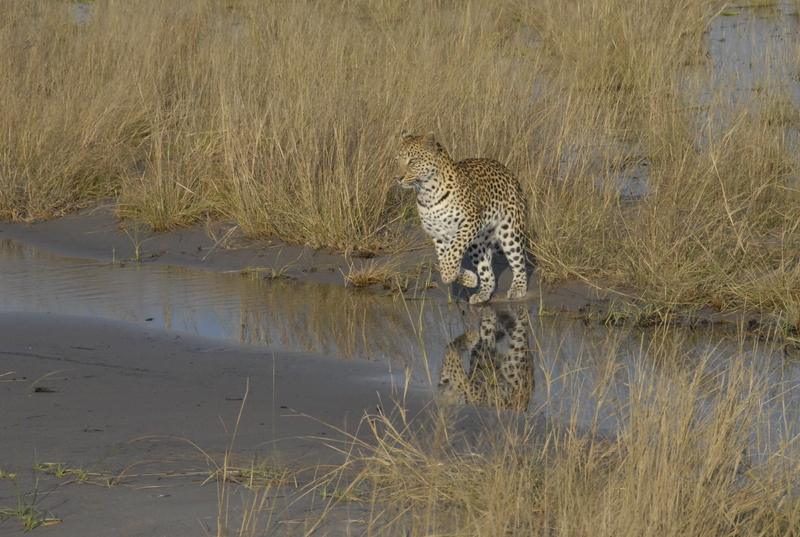 Our first encounter with a leopard came as half of our group was watching four lion cubs feast on a baby zebra. 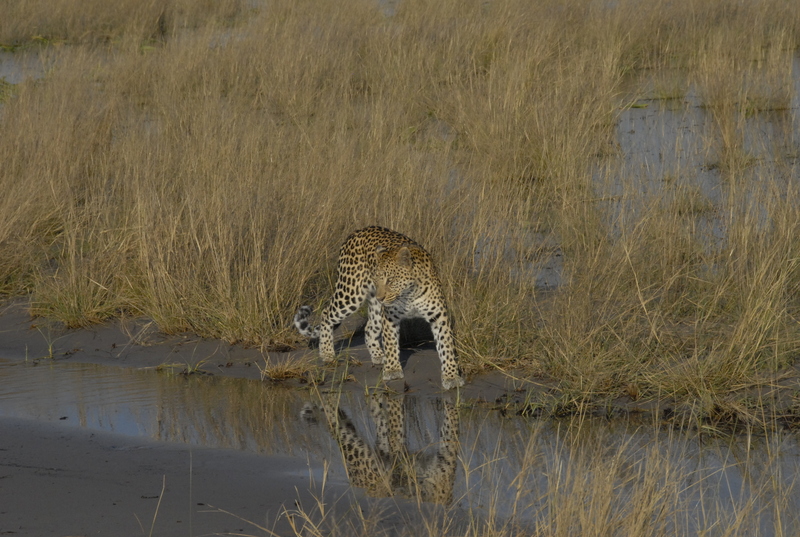 We had originally set out to find the leopard, and when our second vehicle located her, close to the lions, we all drove over to see. She was in a tree, and stayed there for perhaps thirty minutes before dropping to the ground and disappearing in the thick brush. 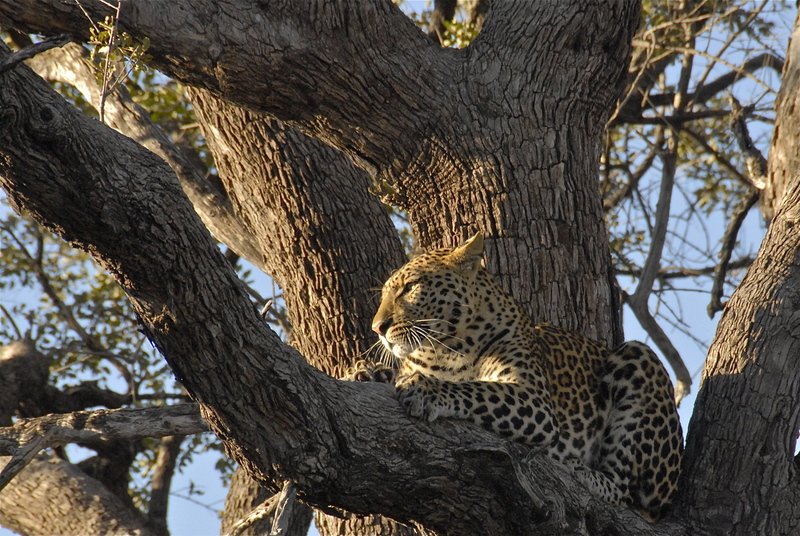 Once in the bush, leopards are so well camouflaged that only well-practiced eyes can spot them. Fortunately, we had an expert tracker in each vehicle. 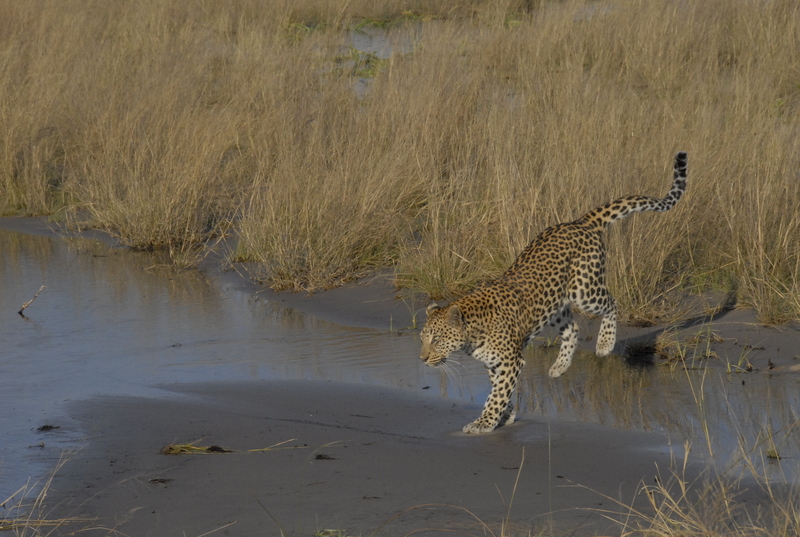 When the leopard finally appeared, ever so briefly, she was a ghostly figure, slipping through the long grass. 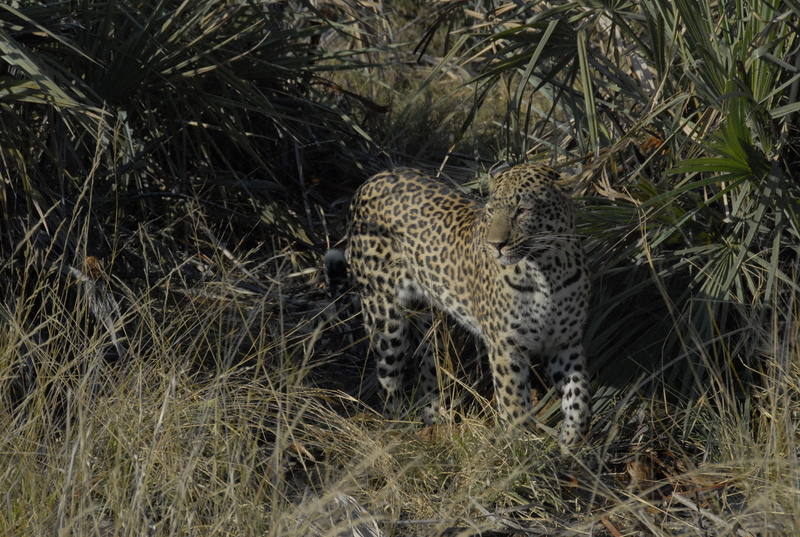 To me, there is no more beautiful cat than a leopard, and I must have taken over 100 photos, because almost every sighting revealed an elegant pose. 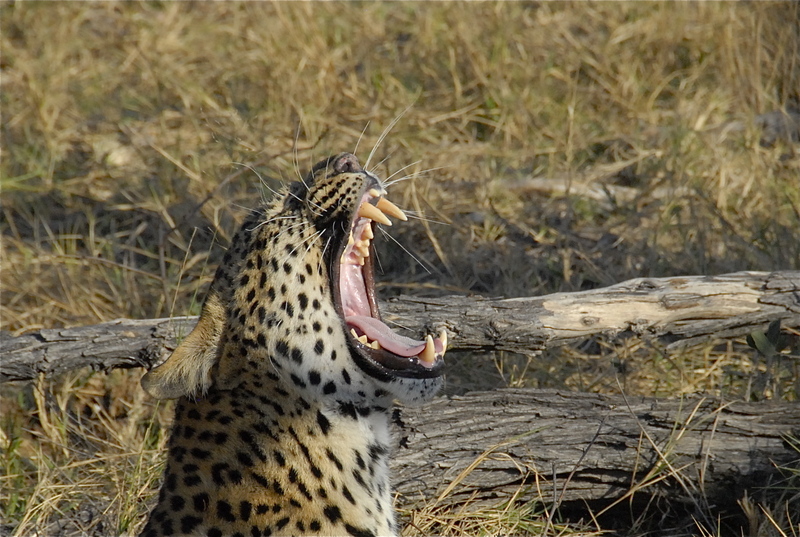 And when at rest, of course she had to yawn. 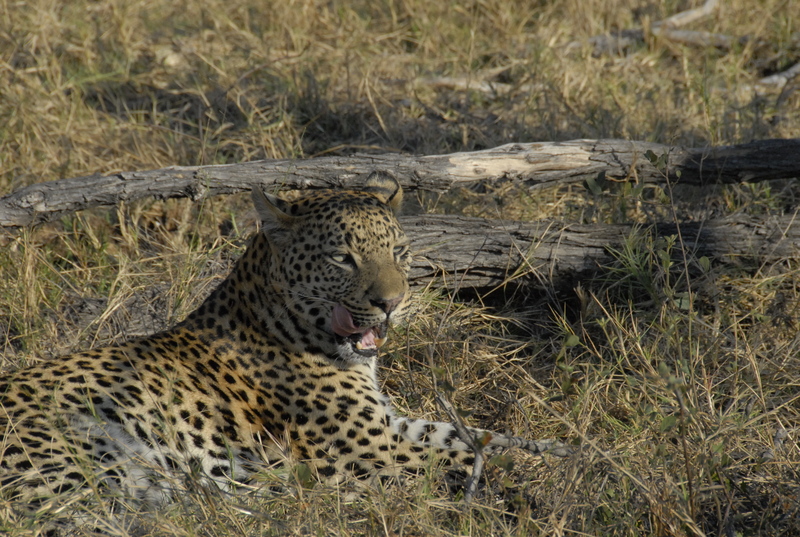 At Tubu Tree camp, we had our best leopard encounter. 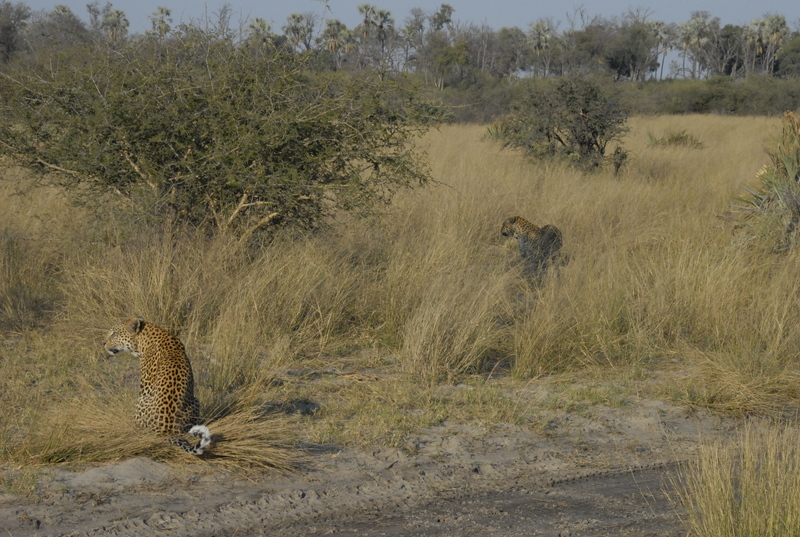 Two females had been challenging each other for territory, and one had eaten the other’s cub a couple of nights previously. We were privileged to watch the culmination of the dispute, as one finally triumphed and the other had to slink away, perhaps to return next year. 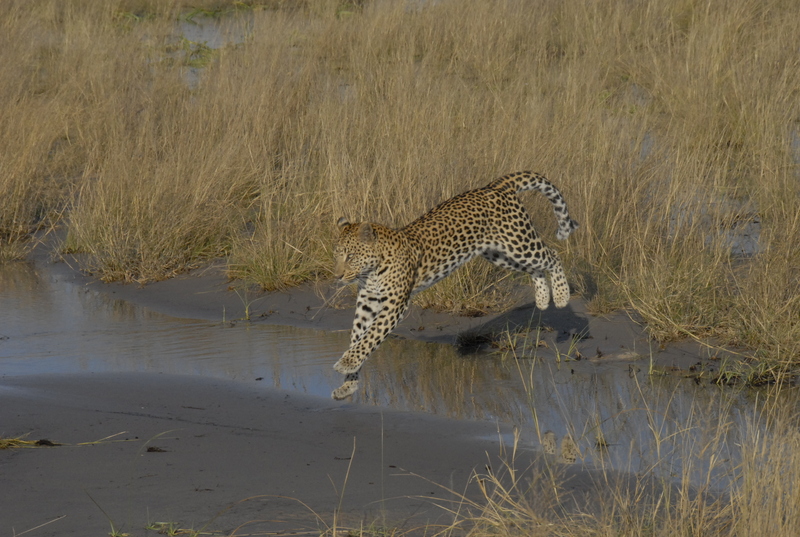 In the photo below, the light was not right, but the body of the leopard in the midst of the jump is magnificent. 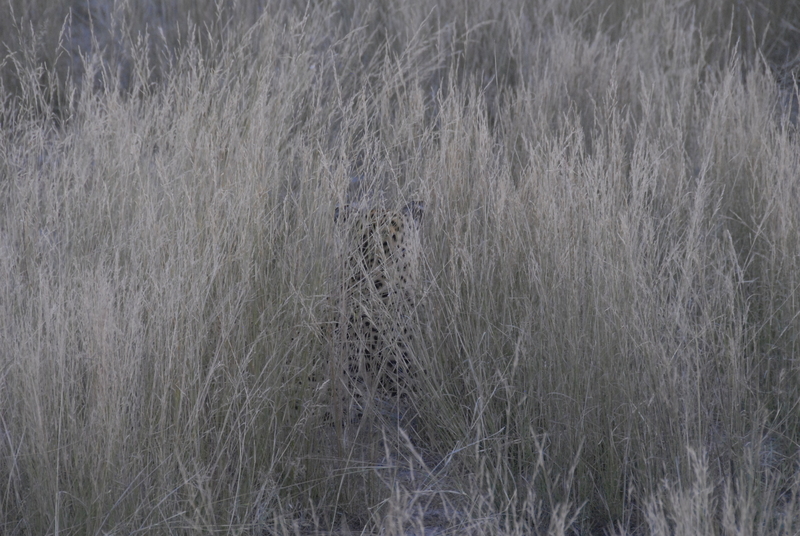 If you look carefully, you will see the second leopard lurking in the grass behind. 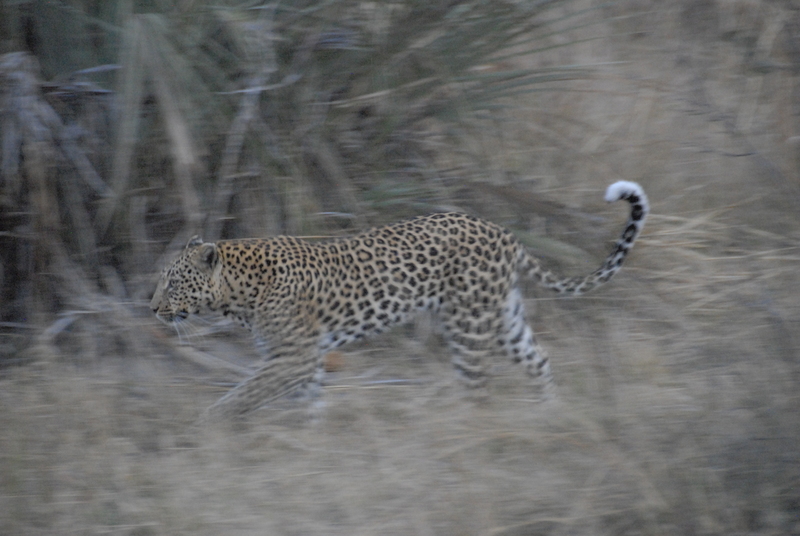 We repositioned our vehicle, and with the rapid fire of my camera, I was able to shoot the following sequence of the second leopard. 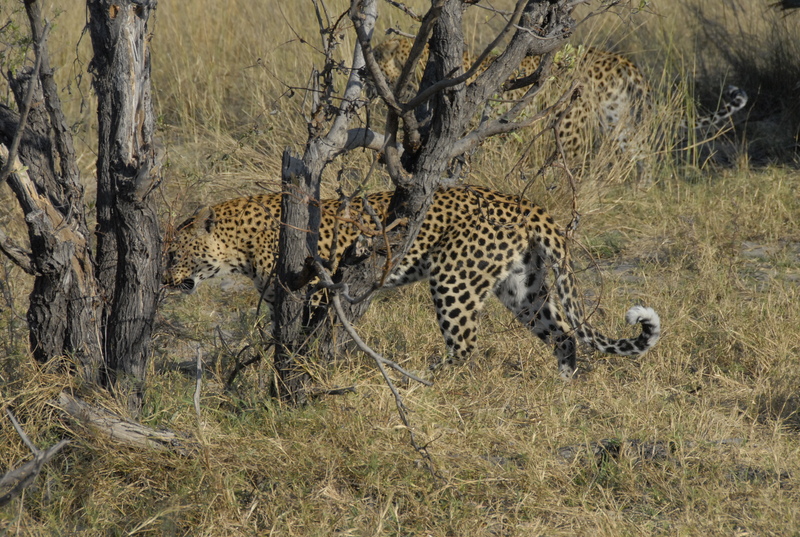 I’m not certain if this second leopard was the eventual winner or loser, since both looked alike to me. 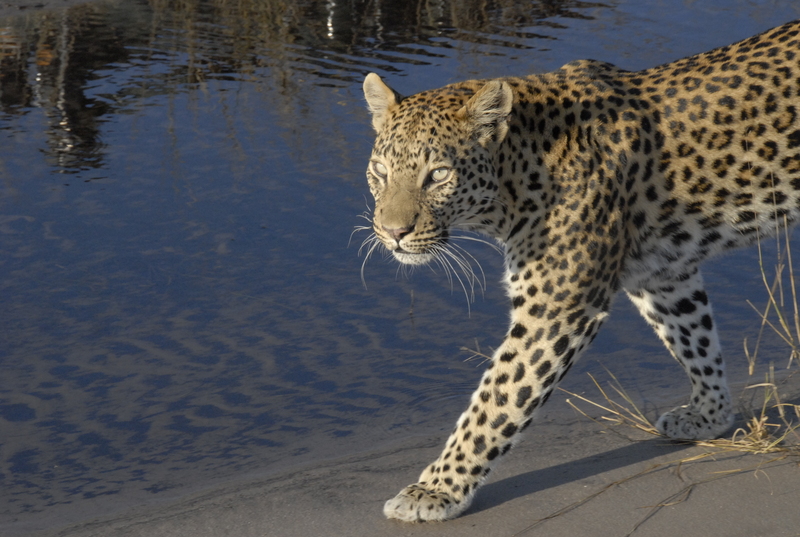 But the grace and beauty of this animal captured my heart. The two rivals walked in close proximity to each other for a long time. The final showdown occurred out of sight, behind the small tree, and lasted no more than five seconds. 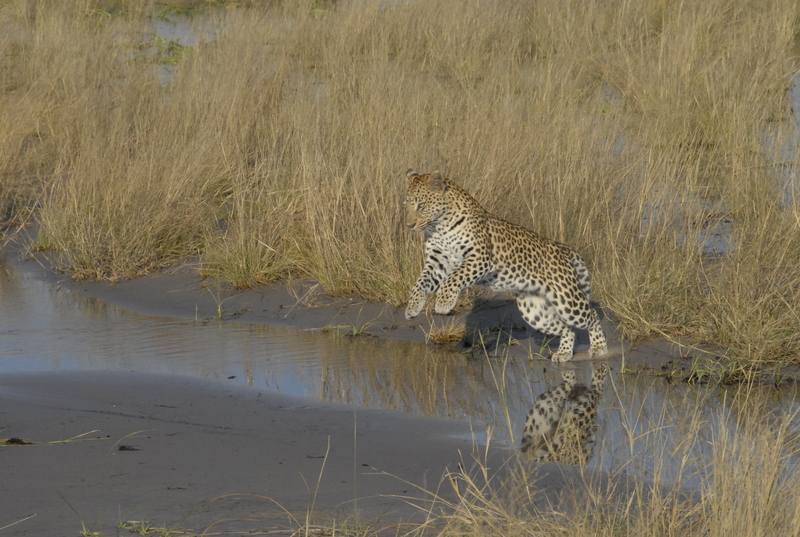 Victory went to the leopard in the rear. The loser assumed a submissive posture and left the scene.